Caroline Brereton, the new CEO of the OCA, is excited about the profession's increased integration into the publicly funded health system. Chiropractic treatment has seen significant growth in Ontario as more patients seek choice in their health care. 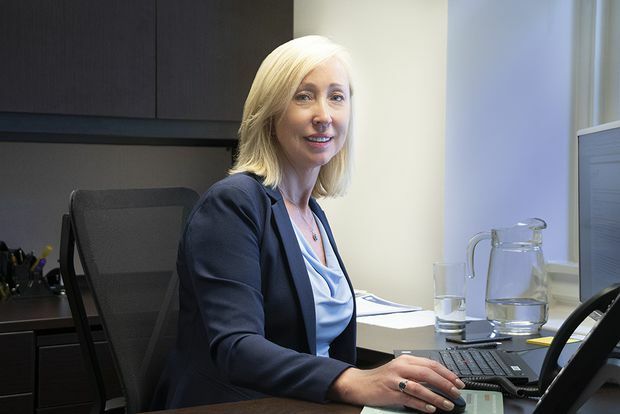 When Caroline Brereton became the CEO of the Ontario Chiropractic Association (OCA) in June, she took the helm of an organization representing the professional interests of more than 3,500 chiropractors in this province. Brereton, a registered nurse with an MBA from Queen’s University and a graduate of the Rotman School of Management’s Advanced Health Leadership Program, arrived with extensive experience in the public health care system, having served as an executive in a hospital for 10 years and as CEO of the Mississauga Halton Community Care Access Centre for seven years. Here, Brereton discusses the OCA’s role in advancing comprehensive health care through chiropractic in Ontario. What are some of the developments you’re most excited about since taking leadership at the OCA? Right now, chiropractors are key to helping Ontario address the opioid crisis. Patient care that involves chiropractors, such as the Primary Care Low Back Pain programs, demonstrates significant results in reducing the use of opioids. Also, I’m really excited about the way chiropractic is becoming more integrated into the publicly funded health care system, which benefits patients. Chiropractors are community-based health professionals able to diagnose and prescribe treatment. And they’re experts in low back pain and musculoskeletal (MSK) conditions, or, more simply, the network of muscles, bones, joints, tendons and ligaments that work together to allow movement. Many people are in the sandwich generation, taking care of children and parents. Patients and families are looking for choice in their health care these days, and they’re looking for providers who view their health in the context of their lives. And they value the comprehensive approach chiropractors take with patients, listening and treating people in a very compassionate way. Chiropractors deliver a great patient experience. I'm excited about that because I think patient experience is so important for shaping the way health care is delivered — whether through the public system or through extended health benefits. What do you wish the public knew about chiropractic care? I wish they understood more about the quality of the education that chiropractors receive. I have been particularly impressed by the Canadian Memorial Chiropractic College in Toronto — from the comprehensive learning around health care and MSK conditions to the manual therapies they employ. I think patients and others in the health care system don’t know how sophisticated the training is for chiropractors’ unique skill set. Did you set goals when you took this job? First, I want to understand why so many people are using chiropractors. I’m curious because chiropractic care has been growing significantly during the last couple of years, despite not being largely part of Ontario’s publicly funded system. We're working to understand more about patient choice and the dynamics that go into choosing a particular provider. Also, I want patients, partners and the Ontario government to know about the leading practices that are part of our chiropractic care, particularly with respect to managing chronic low back pain. I want to share the positive patient outcomes from programs around the province that can be expanded to help patients and our health system. Can you comment on the continuing integration of the profession into hospitals, family health teams and community health centres, as well as projects like the Primary Care Low Back Pain programs and Inter-professional Spine Assessment and Education Clinics (ISAECs)? The goal is to minimize wait times and get patients into the right care. The programs we are involved with that are funded by the Ontario government show significant reduction of wait times and increased patient satisfaction. Integration helps get patients off wait lists, particularly for surgical treatments. When patients are examined by an inter-professional team, surgeries are frequently found to be unnecessary. Let’s return to addressing the opioid crisis. With the seven government-funded Primary Care Low Back Pain programs across Ontario, I think the big win for Ontarians is that chiropractors, working with inter-professional teams, including primary care physicians and nurse practitioners, have shown significant reduction in opioid use among patients. One of the ways we learn is by listening to patients who have had really good experiences. I’d like their voices to be heard more. In my tenure with our publicly funded system, I have seen so much change take place because patients demand the change. The voice of patients will be important to build more confidence in the role of chiropractic care in our health system. What is the importance of World Spine Day on October 16? World Spine Day is an opportunity to make people aware of the importance of spine care to their overall health. An estimated one billion people worldwide suffer from back pain, and it affects all age groups. It is one of the biggest single causes of disability on our planet — an estimated one in four adults will suffer from back pain during their lives. Prevention is key, and this year’s World Spine Day will be encouraging people to take proactive steps to be kind to their spines. Where do you feel the profession is headed in terms of research and education? That's a big question. I know that in choosing a health care provider, more patients are going to look at the evidence of quality outcomes, as well as other patients’ experiences. Both are important. So the sector will continue to conduct research focused on the areas of MSK care, particularly where the research can support proactive, preventive and conservative care. For example, how chiropractors can impact bone and joint health with respect to osteoarthritis, so that we can reduce the number of hip replacements over time. Chiropractors are part of Ontario’s health care solution. Subscribe to Brereton’s blog, Caroline Brereton ON Care at www.carolinebreretononcare.ca. To find out more about how chiropractors can help you get back to doing the things you love, visit www.chiropractic.on.ca. Advertising feature produced by Globe Content Studio. The Globe’s editorial department was not involved.